Everyone should have a provider who can step back and look at the “big picture” of their health, especially during times when a diagnosis is needed. 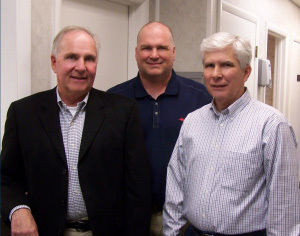 For the past 78 years Costin Family Practice has provided patients with excellent medical care. Costin Family Practice can be found in the Swan Building at 130 N. Detroit Street here in Bellefontaine and it has probably seen more generations of Logan County’s sick than any other building in existence today. Dr. Swan, a medical doc-tor, along with Dr. Edward V.M. Thompson, a dentist, worked out of the office until 1927, when Dr. R.H. Van Vleck bought the operation. In 1932 Dr. John Morrow joined Dr. Van Vleck and they brought Dr. James F. Costin into the practice in 1937, according to the late Dr. Costin’s son Dr. Arthur Costin, who joined his father in practice in 1975. The Costin family including Dr. Scott Z. Costin has practiced there ever since, along with several partnering doctors over the years, including doctors Walter L. Collins, W. Blair Casey, Steve Hooley, Tony Pullman and Thomas Dar-rah. In addition to the Bellefontaine office Costin Family Practice has an office in Russells Point. With two locations they are able to better serve the Logan County community. Costin Family Practice is a team effort. The patient needs to feel that he/she is part of the decision making process. The goal of each visit should be to have a level playing field where the patient can voice concerns openly, feeling a sense of safety, rapport, and trust. “I have always found fam-ily medicine exciting. I joined my father 40 years ago. I delivered many babies back then and now find myself taking care of their grandchildren. I enjoy the “art of diagnostics”, a patient comes in with symptoms and you’re task the pro-cess of finding out a diagnosis and plan of treatment,” states Dr. Art Costin. This day ‘n age a family doctor provides the patient with a continuity of care, navigating through a sea of specialist. “We are the patients advocate,” says Costin. These days walk-in clinics are popping up in more storefronts around the country as an alternate to the family doctor. However, there are so many benefits of a family doctor. They are familiar with the physical, emotional and lifestyle factors that can affect the health and well-being of every mem-ber of the patient’s family. They maintain all their patient’s health records in one place, thus mak-ing it easy to access medical histories, test results and other medical referrals. Family doctors also have a wide range of training which allows them to diagnose, treat and heal a variety of conditions. In addition to family practice the Costin family has been the team physician for Bellefontaine High School for over 60 years. The late Dr. James Costin was selected after serving 38 years as team physician for Chieftain Athletics to receive an “Outstanding Ohio Team Physician Award” by the Joint Advisory Committee on Sports Medicine of the Ohio State Medical Association and the Ohio High School Athletic Association. 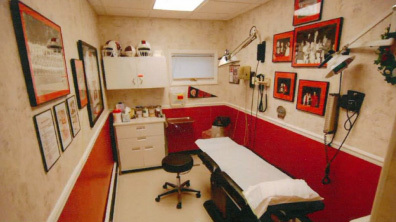 As seen in the above picture, the Costin family shows their spirit and historical artifacts for the Bellefontaine High School’s football program in some of the patient rooms. The Logan County Chamber of Commerce would like to congratulate Costin Family Practice for be-ing chosen as the April Business of the Month, for their 33 years as chamber members and for their service to Logan County.